Epidermal nevus syndrome (ENS) is a rare neurocutaneous disorder where epidermal nevus is associated with abnormalities in other organ systems like central nervous system, cardiovascular system, genitourinary system, eyes, and bone. Various syndromes and different types of epithelial nevi have been described in association with the umbrella term "epidermal nevus syndrome." Epidermal nevi have an incidence of around 1 per 1,000 live births. Of patients with epidermal nevi, 10-18% may have disorders in other organs suggesting an ENS. , Solomon had coined the term "epidermal nevus syndrome" in 1968 and since then lot of confusion about its nomenclature and types of ENS was prevailing till recently a beautiful review was done by Rudolf Happle ,[4 ] and nine well-defined ENSs were identified. We are reporting a patient of ENS with clinical and histopathologic features of a subtype called as GARCIA-HAFNER-HAPPLE SYNDROME. A 14-year-old girl presented with history of seizures for one year. She had focal dyscognitive seizures with secondary generalization with semiology consisting of transient giddiness followed by vacant blank stare, loss of contact with surrounding, which was associated with deviation of eyes to the left side and tonic clonic movements in left upper and lower limbs with loss of consciousness for 3-4 minutes, followed by amnesia about the event. She had 4 such episodes of temporal lobe focal dyscognitive seizures with secondary generalization prior to consulting us. She was born out of non-consanguineous marriage with normal vaginal delivery, no perinatal insult, and normal developmental milestones. She was found to have multiple hyperpigmented lesions over neck, abdomen, and back since birth. These lesions were progressive in nature and had become more pigmented and hyperkeratotic over the last 3-4 years. Lesions were not preceded by blistering or inflammatory changes. There was no history of any endocrinal, dermatological, or systemic disorders in any of the family members. On examination, she had normal skeletal and mental development appropriate to her age. She had no abnormality in respiratory, cardiac, gastrointestinal, and central nervous system examination. 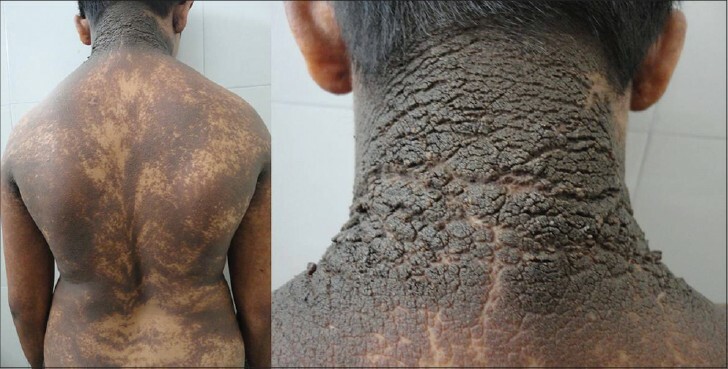 She was noticed to have multiple hyperpigmented, hyperkeratotic verrucous plaques over the face, arm, legs, chest, back, and abdomen distributed in a blaschkoid pattern. She also had acanthocytosis nigricans over nape of neck [Figure 1]. She was not hirsute or obese, had no hair or nail abnormality. She was found to have posterior subcapsular cataract in both eyes. Her echocardiography and ultrasonography of abdomen were normal. Electroencephalography revealed focal right temporal sharp and slow wave discharges, and magnetic resonance imaging of brain with contrast did not show any abnormality. All other routine investigations were normal including fasting glucose and insulin levels. 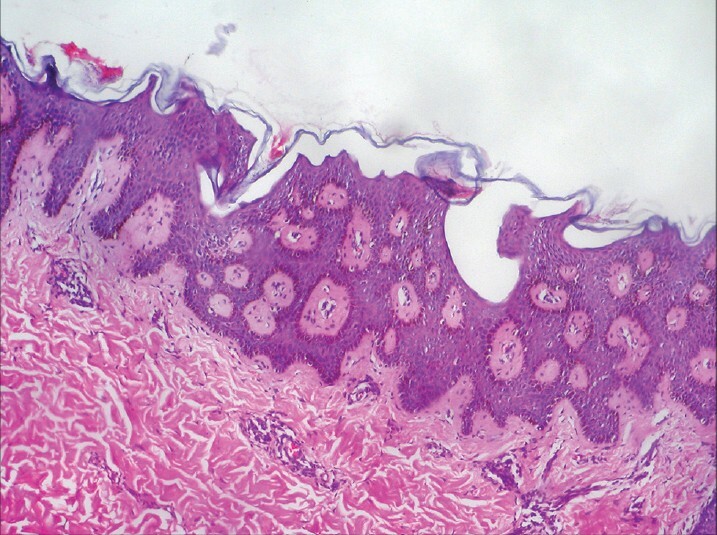 A diagnosis of epidermal nevus syndrome was considered, and patient was subjected to skin biopsy, which showed epidermal acanthosis, hyperkeratosis, orthokeratosis, papillomatosis, and finger-like papillary projections without any signs of epidermolysis, with variable pigmentation of basal layer of epidermis. The histopathologic findings were suggestive of non-epidermolytic, non-organoid keratinocytic type of epidermal nevus with associated acanthosis nigricans [Figure 2]. Anti-epileptic therapy with oxcarbazepine was titrated to a dose of 15 mg/kg/day leading to complete seizure control over the last one year. For skin lesions, she was treated with topical tretinoin cream 0.025 percent once daily for 6 months with not much improvement. Ablative CO2 laser treatment is planned as the next line of treatment for her skin lesions. Epidermal nevi are hamartomas arising from ectoderm as a result of somatic mutation or genetic mosaicism. Most epidermal nevi are sporadic and are seen in children of either gender since birth. Epidermal nevi are overgrowths of structures and tissue of the epidermis of the skin. The different types of epidermal nevi are variable in size, number, location, distribution, and appearance and so also in nomenclature. When present in association with systemic, neurological, ophthalmic, genito-urinary, or cardiac disease, they are referred to as Epidermal Nevus syndrome [ENS]. When somatic mutation occurs early in the embryonic life, mesenchymal and ectodermal layers are also involved. All well-defined ENS are lethal, and survival is explained by mosaicism. , There are different ways to classify ENS, on the basis of the type of epidermal nevus, on the presence or absence of heritability, on the basis of histopathologic findings, and on the basis of well-defined common associations of a particular type [Table 1]. There are 9 well-defined and 7 less well-defined subtypes of ENS, each with specific clinical phenotype. Besides this, there are more than 400 other miscellaneous case reports of ENS in association with other rare features including hepatic and renal abnormalities, McCune-Albright syndrome More Details, patent ductus arteriosus, vascular nevi in addition to other common abnormalities. The principal way of differentiating epidermal nevus is into organoid and keratinocytic types. Organoid nevi constitute epithelial nevi showing hyperplasia or structural changes of sebaceous glands or hair follicles while non-organoid keratinocytic nevi show differentiation exclusive to keratinocytes. Other histopathologic associated abnormalities of epidermal nevus include acantholytic, porokeratotic, inflammatory linear verrucous nevus, acanthosis nigricans, and Hailey disease-like features. Neurologic co-morbidity with epidermal nevus syndrome is variable and it may have a correlation with location of the nevus and the other extracutaneous disease. Nevus lesions involving the face or scalp are generally associated with cognitive deficits, mental retardation, and seizures, which are seen in nearly half of such patients. Focal epileptiform discharges and focal slowing are the most common EEG abnormalities, and the EEG abnormality is usually ipsilateral to the nevus. Other neurological symptoms associated with ENS include cranial nerve palsies, hemiparesis (especially in patients with hemimeganencephaly), microcephaly, and behavior problems. Occasional case reports also associate ENS with corpus callosum agenesis, Dandy Walker syndrome, spina bifida, and syringomyelia. Cerebrovascular anomalies occur in approximately 10% of patients with ENS. Intracranial blood vessels may be dysplastic, dilated, or occluded. Leptomeningeal hemangiomas, arteriovenous malformations, aneurysms and their related complications like hemorrhage, infarcts with resultant porencephaly and dystrophic calcification have been associated with ENS. Other associated neuroimaging abnormalities include hemimegalencephaly, focal pachygyria, and other types of cortical dysplasia, which are the cause for focal epilepsy in patients with ENS. Besides nervous system, other systemic anomalies in ENS include skeletal, ophthalmologic, cardiovascular, and nephrologic abnormalities. Various forms of skeletal involvement are reported with ENS such as thickening of the cranial vault, fibrous dysplasia, bony defects like scoliosis, kyphoscoliosis, and ipsilateral hyperplasia involving the calvarium, mandible, scapula, ribs, vertebrae, or long bones of the extremities. Vitamin D-resistant rickets, phosphaturia, hypophosphatemic rickets have also been reported with different ENS. Ocular abnormalities occur in 22% to 68% of patients of various ENS. Defects described include ophthalmoplegia, strabismus, optic nerve hypoplasia, colobomata of the retina, choroid, iris or eyelids, microphthalmia, macrophthalmia, cataracts, ocular hemangiomas, and optic nerve gliomas. Patent ductus arteriosus and coarctation of the aorta are the most common cardiovascular anomalies described in ENS. Vascular malformations, endocrinal problems like central precocious puberty, renal anomalies like horseshoe kidneys, Wilms tumor, nephroblastoma, renal artery stenosis, sensorineural deafness, partial anodontia, auto amputation of fifth toe are some occasional anomalies reported with ENS. Our patient had characteristic hyperpigmented lesions of the skin distributed in a segmental pattern along Blaschko's lines. There was associated acanthosis nigricans at the nape of neck in addition to these lesions. She had bilateral posterior subcapsular cataracts in the eyes. She also had temporal lobe epilepsy. Histopathological findings were suggestive of non-epidermolytic, non-organoid keratinocytic type associated with keratinocytic epidermal nevi. 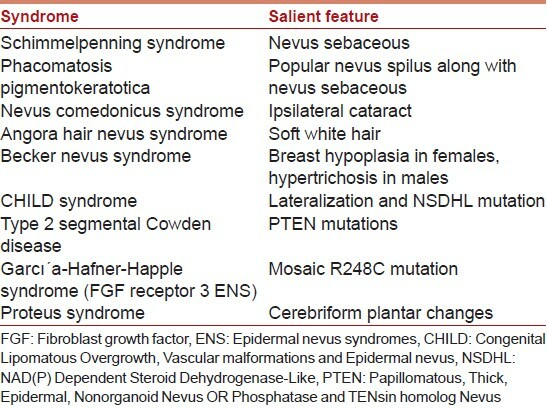 Such types of ENS include Proteus syndrome, type 2 segmental Cowden disease and CHILD syndrome and Fibroblast growth factor receptor 3 ENS (Garcý'a-Hafner-Happle syndrome) [Table 1] and [Table 2]. In absence of features of other syndromes, a diagnosis of fibroblast growth factor receptor (FGFR) 3 ENS (also termed as Garcia-Hafner-Happle syndrome) was considered. A large proportion of human epidermal nevi are caused by mosaicism of post-zygotic activating FGFR3 mutations in human epidermis. R248C mutations within the FGFR3 gene have been found to be associated with approximately one-third of keratinocytic nevi of the non-epidermolytic category. Acanthosis is a common finding, which is assumed to be due to insulin-like growth factor 1 receptor-like activity of FGFR [Fibroblast growth factor receptor (are all tyrosine kinase receptors), and acanthosis nigricans seems to be a final common sign of a variety of processes seen in few patients with ENS. There was no positive family history in our case and so whether this represents an inherited disorder or is the result of somatic mutation is not known. The current standard therapy for epidermal nevi is surgery or ablative CO2 laser treatment. Topical therapies such as topical retinoids, topical and intralesional steroids, topical calcipotriol, topical podophyllin, dithranol, 5-fluorouracil cream, and destructive modalities such as electrodessication, dermabrasion, shave excision, or cryotherapy may temporally improve the appearance of the lesion, but recurrence is the rule. , Definitive treatment involves full-thickness excision, which may not be possible in large or extensive lesions. Carbon dioxide laser is an alternative option; however, scarring and pigmentary alteration are potential permanent complications, especially in patients with darker skin types. Neurologic management consists of appropriate anti-epileptic therapy according to the type of seizures. To Department of Pathology, Pramukhswami Medical College and Shree Krishna Hospital, Karamsad for photo-micrograph of skin biopsy. 1. Happle R. The group of epidermal nevus syndromes Part I. Well defined phenotypes. J Am Acad Dermatol 2010;63:1-24. 2. Paley K, English JC 3 rd . Delayed diagnosis of epidermal nevus syndrome associated with substantial brain malformations: A case report and review of the literature. Cutis 2008;81:274-6. 3. Vidaurri-de la Cruz H, Tamayo-Sánchez L, Durán-McKinster C, de la Luz Orozco-Covarrubias M, Ruiz-Maldonado R. Epidermal nevus syndromes: Clinical findings in 35 patients. Pediatr Dermatol 2004;21:432-9. 4. Happle R. The group of epidermal nevus syndromes Part II. Less well defined phenotypes. J Am Acad Dermatol 2010;63:25-32. 5. de Waal AC, van Rossum MM, Bovenschen HJ. Extensive segmental acanthosis nigricans form of epidermal nevus. Dermatol Online J 2010;16:7. 6. Hafner C, van Oers JM, Vogt T, Landthaler M, Stoehr R, Blaszyk H, et al. Mosaicism of activating FGFR3 mutations in human skin causes epidermal nevi. J Clin Invest 2006;116:2201-7. 7. Higgins SP, Freemark M, Prose NS. Acanthosis nigricans: A practical approach to evaluation and management. Dermatol Online J 2008;14:2. 8. Dodge NN, Dobyns WB. Agenesis of the corpus callosum and Dandy-Walker malformation associated with hemimegalencephaly in the sebaceous nevus syndrome. Am J Med Genet 1995;56:147-50.